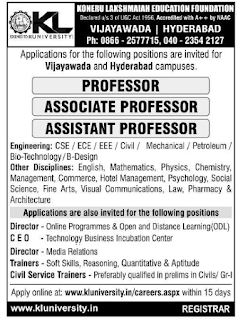 K.L University Professor / Associate Professor / Assistant Professor Posts. Refer the official website www. Kluniversity.in for more details about K.L University Jobs. Available vacancy, Salary, Important dates, Selection Process, Application Procedure, Qualification are given below. Professor / Associate Professor / Assistant Professor Jobs in K.L University. 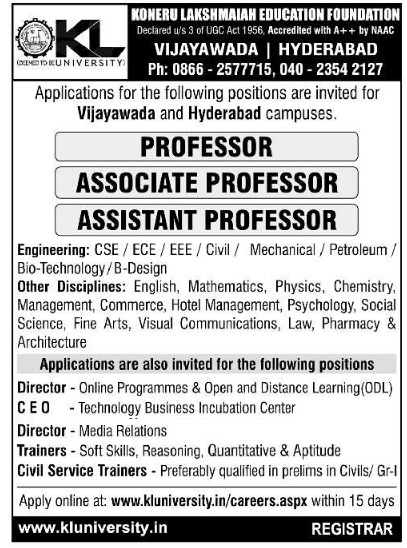 Starting date to apply for Assistant Professor Jobs: 09-04-2019. Ending date to apply for Assistant Professor Jobs: within 15 days from the notification date. Interested candidates can apply ONLINE to the college official web site is given below.